The massacre of 53 members of the Hazara tribe in an imambargah, a Shia place of worship, at Quetta, the capital of the Balochistan province of Pakistan, on July 4, 2003, while they were praying by three unidentified gunmen, has come close on the heels of the massacre of 11 Hazaras undergoing police training last month in the same city. This is an attempt by the Taliban and Al Qaeda dregs, who have taken shelter in Pakistan’s tribal belt, to drive out the Hazaras, who are Shias, from this area lest they be used by the US intelligence agencies to collect intelligence about the presence of Osama bin Laden and these dregs in the tribal belt of the North-West Frontier Province (NWFP) and Balochistan. 2. All the three gunmen are reported to have perished during their attack. Two of them allegedly blew themselves up after killing the Shia Hazaras, while the third allegedly succumbed to the injuries sustained by him in an exchange of fire with some members of the security forces guarding the place. 3. The incident has led to violent disturbances in Quetta forcing the local authorities to impose a curfew, which has not yet been lifted at the time of my writing these comments. The provincial administration has ordered an enquiry into the massacre by a retired Major-General. 4. Since the controversial elections held in Pakistan in October last, the NWFP is being ruled by a coalition of six pro-bin Laden and pro-Taliban religious fundamentalist parties called the Muttahida Majlis-e- Amal (MMA). It won an absolute majority of the seats in the NWFP provincial assembly. In Balochistan, the MMA did well in some Pashtun majority areas, but not so well in the other areas inhabited by the Balochis, where the Balochi nationalist parties, demanding autonomy or independence for Balochistan, and the pro-Pervez Musharraf Pakistan Muslim League (Qaide Azam), which is now in power in Islamabad at the head of a coalition, did better. As a result, an absolute majority eluded the MMA in Balochistan. It had to form a coalition in association with the PML (QA). 5.When the Taliban was in power in Kabul before October 2001, it had carried out large-scale massacres of the Hazaras in central Afghanistan with the help of Al Qaeda and the Lashkar-e-Jhangvi (LEJ), the militant wing of the Sipah-e-Sahaba Pakistan (SSP). The Hazaras were targeted as the Taliban suspected their collaboration with the Northern Alliance and the Iranian intelligence. There were, however, no attacks on their kinsmen in the NWFP and Balochistan at that time. 6. Now that the dregs of the Taliban and Al Qaeda are using these two provinces, with the complicity of the fundamentalist government in power in the NWFP and the coalition with fundamentalist participation in Balochistan, as sanctuaries for their operations in Afghanistan, the US intelligence has intensified its operations in these two provinces. This has been particularly so since the capture in March last of Khalid Sheikh Mohammad, supposedly the chief of operations of bin Laden, who had allegedly masterminded the terrorist strikes of 9/11 in the US. 7. Khalid was arrested by the Pakistani authorities from the house of a women’s wing leader of the Jamaat-e-Islami (JEI) in Rawalpindi and handed over to the Federal Bureau of Investigation (FBI). Immediately after this, George Tenet, Director of the Central Intelligence Agency (CIA), had flown to Islamabad to personally thank Musharraf for the arrest and hand-over. The US authorities considered the arrest as their biggest catch in Al Qaeda since 9/11. Their happiness with Musharraf over this was reflected in the red carpet welcome accorded to him, reportedly on the CIA’s advice, at Camp David on June 24 and the announcement of a US $ three billion aid package to Pakistan from 2005, subject to certain conditions. 8. It was reported immediately after the arrest that Khalid was operating from a hide-out in Karachi till September last year along with Ramzi Binalshibh, another important lieutenant of bin Laden. When the Pakistani authorities, prompted by the US intelligence agencies, arrested Ramzi in the last week of September, Khalid managed to escape to Quetta where he had been given sanctury by the JEI. It is said that in the beginning of this year, the US intelligence was tipped off by a member of the Hazara community in Quetta about the presence of Khalid in their city. 9. At the prodding of US intelligence officials, the Pakistani authorities mounted a search for him. He escaped to Rawalpindi and obtained shelter in the house of the JEI women’s wing leader there, where he was ultimately arrested. After he was transferred to the custody of the FBI, the US authorities, with the help of their Pakistani counterparts, mounted a search for bin Laden and one of his sons as well as for other dregs of Al Qaeda in the tribal belt of Pakistan, particularly in Balochistan. Many of the dregs managed to elude capture and crossed over into the adjoining Balochi areas of Iran, where some of them were arrested by the Iranian authorities. 10. While the Iranian authorities have not so far revealed the identity of those allegedly held by them, there has been media speculation that the arrested included some top leaders of Al Qaeda, including possibly a son of bin Laden and Ayman-al-Zawahiri, an Egyptian, who was No. 2 to bin Laden. This media speculation has not so far been confirmed. 11.The arrests of Ramzi Binalshibh, Khalid Sheikh Mohammad, Waleed bin Attash, a suspect in the case relating to the attack on the US naval ship USS Cole at Aden in October, 2000, in April in Karachi, and two other dregs of Al Qaeda made the Al Qaeda leadership suspect that the Shia members of the Hazara community in Balochistan and of the Kashmiri community in Gilgit in the Northern Areas (NA) had been collaborating with the US intelligence in its hunt for the dregs of Al Qaeda and the Taliban. 12. While the Shia Hazaras had grounds for anger against Al Qaeda and the Taliban for the reasons mentioned above, the Shia Kashmiris had grounds for anger due to the role played by bin Laden and his Sunni tribal supporters in helping the Pakistan army in ruthlessly suppressing a Shia revolt in Gilgit in 1988, resulting in hundreds of deaths of the local Shias. 14. In the past, the Sipah-e-Sahaba Pakistan (SSP), a Sunni extremist organisation demanding the declaration of Pakistan as a Sunni state and of the Shias as non-Muslims, had carried out the massacres of a large number of Shias, including the educated leaders of their community, in the Pakistani Punjab, the NWFP and Karachi, but they had not indulged in any violent activities in Balochistan. Public shock and Iranian anger over the murder of a number of Shia doctors in Karachi forced Musharraf to declare the LEJ and the Sipah Mohammad as terrorist organisations and ban them on August 14, 2001. When this did not stop the attack on the Shias and the reprisals by the Shias against the Sunnis, he declared the SSP and the TEJ also as terrorist organisations and banned them on January 15, 2002. 15. Despite these bans, the LEJ, which is a member of bin Laden’s IIF, actively participated, along with other Pakistani components of the IIF such as the Harkat-ul-Mujahideen (Al Alami–International),the Jaish-e-Mohammad (JEM)and the Lashkar-e-Toiba (LET) in the kidnapping and murder of Daniel Pearl, the US journalist, the suicide car bomb explosion outside a Karachi hotel which killed some French engineers working in a submarine assembly project, the hand grenade attack on a group of foreigners worshipping in an Islamabad church resulting in the death of the wife and daughter of a US diplomat, the car bomb explosion outside the US consulate in Karachi in which some Pakistanis were killed and in the attack on a group of European tourists moving by the Karakoram Highway to Xinjiang in China. 16. These incidents brought pressure on Musharraf from the West to act decisively against these organisations. He did act vigorously against the LEJ, which is not involved in terrorist violence against India in Jammu & Kashmir (J&K) and the HUM (Al Alami), but avoided action against the JEM and the LET, which are used by Pakistan’s Inter-Services Intelligence (ISI) in its operations in Indian territory. 17. The action against the LEJ did lead to a drop in anti-Shia violence in Pakistan in the second half of last year. But the situation started hotting up again after the October elections. Musharraf ordered the withdrawal of terrorism related cases against Maulana Azam Tariq, the leader of the SSP, which has since changed its name to avoid action under the Anti-Terrorism Act, to enable him to contest the elections to the National Assembly, which he won. Since his election, he has been travelling frequently all over Pakistan to revive the activities of his followers. 18. While Musharraf has been taking strong action against the members of Benazir Bhutto’s Pakistan People’s Party Parliamentarians (PPPP) and Nawaz Sharif’s PML (N) even for firing with air guns on festive occasions such as marriages, he has not taken any action against the Maulana and his followers, who have been moving around with AK-47s and other deadly weapons in violation of the laws banning the carrying of weapons by civilians. 19. Balochistan has been on the boil since October last year. 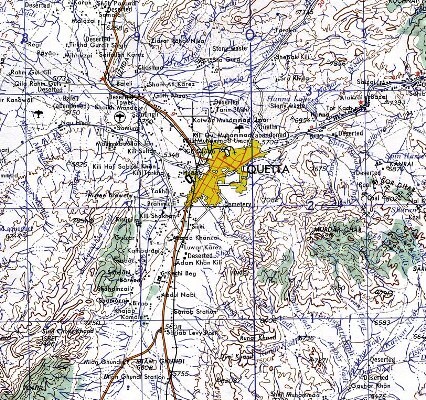 In addition to the anti-Hazara anger referred to above, another reason for the disturbed situation in the province, unrelated to the presence of the Al Qaeda and the Taliban dregs, is the growing anger of the Balochi nationalist elements over the payment of inadequate royalty by the Islamabad Government to the Balochi tribes for the oil and gas found in their territory and over the re-settlement of a number of Punjabi ex-servicemen in the Mekran coast to work in the Chinese-aided project for the construction of the Gwadar port and a high way along the coast connecting the area to Karachi. 20. The Gwadar port has great strategic importance for Pakistan. It would reduce the present dependence of the Pakistan economy and Navy on the Karachi port, which is within striking range of the Indian Navy. Following the mobilisation of Indian troops and their deployment on the India-Pakistan border in the wake of the attack by the LET and the JEM on the Indian Parliament in December,2001, Beijing had agreed to a request from Musharraf to expedite the construction of the Gwadar port in order to complete it in four years instead of five as originally planned. 21. To enable this expedited construction and to prevent any sabotage of the project by Balochi nationalist elements, he has given preference to the employment of Punjabis imported from other parts of the country. The resulting anger in the Balochi community has taken an anti-Islamabad turn. While there has been a number of attacks by unidentified elements on the gas pipelines supplying gas from Balochistan to Punjabi industries, there has so far been no acts of violence directed against the Gwadar project. 22. The Corps Commanders of the Pakistan Army as well as the Cabinet of Prime Minister Mir Zafarullah Khan Jamali had held a number of meetings earlier this year to consider the worrisome situation in Balochistan. One of the options considered was to dismiss the provincial government and impose army rule in the province. Jamali, a Balochi himself, is viewed by the Balochis as an army stooge and, as such, does not command much respect and authority from fellow-Balochis. Musharraf appointed Lt Gen Abdul Qadir, who retired as the Corps Commander recently, as the Governor of Balochistan, to keep a strict watch over the activities of the provincial Cabinet headed by Chief Minister Jam Mir Muhammad Yousuf and to ensure the restoration of law and order. He has not so far been effective. One should not be surprised if Musharraf resorts to the military rule option. 23. To keep the non-Punjabi areas of Pakistan under effective control, a stock response of the Pakistan Army has always been to re-settle Punjabis, particularly ex-servicemen, in non-Punjabi areas. Zia-ul-Haq had a large number of Punjabis re-settled in Sindh, in the Northern Areas and in Pakistan-Occupied Kashmir (POK). Musharraf has embarked on a similar policy of re-settling a large number of Punjabis in Balochistan. This policy is expected to be expedited in the wake of the disturbed situation there.